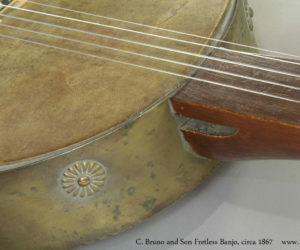 This C. Bruno and Son fretless banjo arrived here about 15 years ago and has been in storage ever since. As is often the case with my “projects”, it was forgotten for years. I recently came into a lovely set of Ivoroid friction tuners that reminded me of the Bruno banjo and its need for appropriate tuners. This 130-year-old set of friction pegs were typical of the 1880s or 90s. And since they are synthetic ivory, they are legal under the CITES regulations.